It’s finally cool enough in Cincinnati to have hot food for breakfast. I love oatmeal, but sometimes want something a little different for breakfast. Have you tried quinoa for breakfast? I tend to have a lot of quinoa on hand from previous cooking demos. It’s a favorite grain for me because of its versatility and strong nutritional profile. Quinoa is higher in protein and fiber than other grains, which means it promotes satiety (read FULLNESS). In addition, it’s a decent source of iron- a nutrient that can be deficient, particularly for women and kids. Typically, I have used it for savory dishes with vegetables and beans. Today was different! I made a small batch as a trial, but the recipe can be doubled or tripled to serve more. Below is what transpired. While still hot, add cinnamon, ginger paste, brown sugar and slivered almonds. 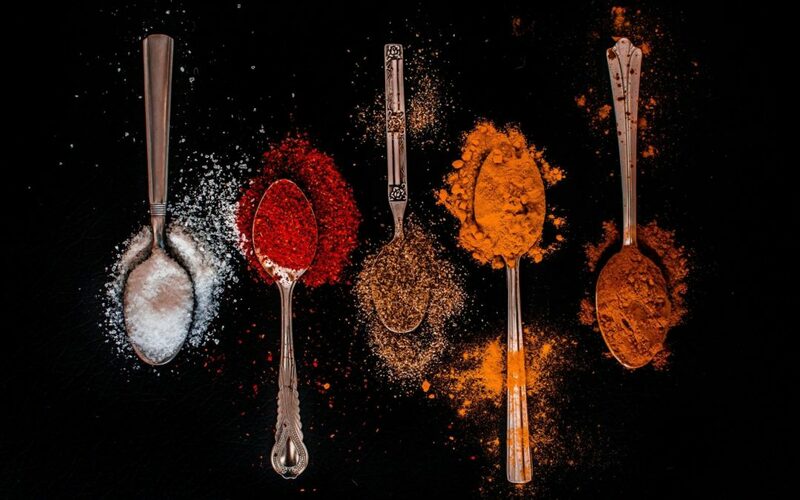 Mix and serve warm. Summer is a perfect time of year to enjoy grain salads. If you’ve got a picnic, potluck or just want something delicious for dinner, look no further! This salad combines farro, fresh spinach, arugula and dried cherries in a simple orange dressing. It can be made ahead of time or a few hours before your next soiree. Cook farro according to directions and set aside to cool in a large mixing bowl. 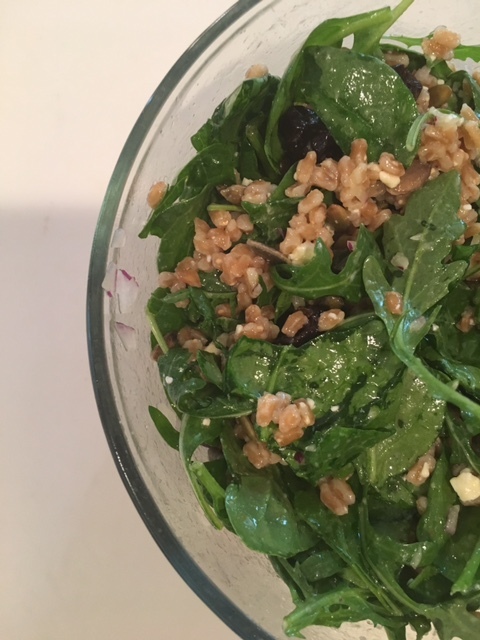 Once farro has cooled, add spinach, arugula, chopped onions, feta cheese, dried cherries and pepitas. Whisk together orange juice and olive oil into a dressing. Pour dressing over the salad and toss it. Makes 6 servings. Nutrition facts per serving: 217 calories, 12.8 grams fat, 5 grams protein, 23 grams carbohydrate, 3 grams fiber, 5.6 mg cholesterol, 85 mg sodium. You’ll pinch yourself when you realize how easy and delicious this tuna salad is. There’s no doubt- green is the new black! Avocados have become wildly popular for their versatility, availability and nutritional prowess. Loaded with heart-healthy mono-unsaturated fat, avocados are showing up in everything from pudding to toast. This salad requires minimum prep time, though you’ll have to chop some onions and celery. It does not contain hard boiled eggs, but you could certainly add them if you like. In addition to mono-unsaturated fat, avocados are also a great source of potassium, a nutrient needed to help reduce blood pressure. Place all ingredients in a medium bowl. 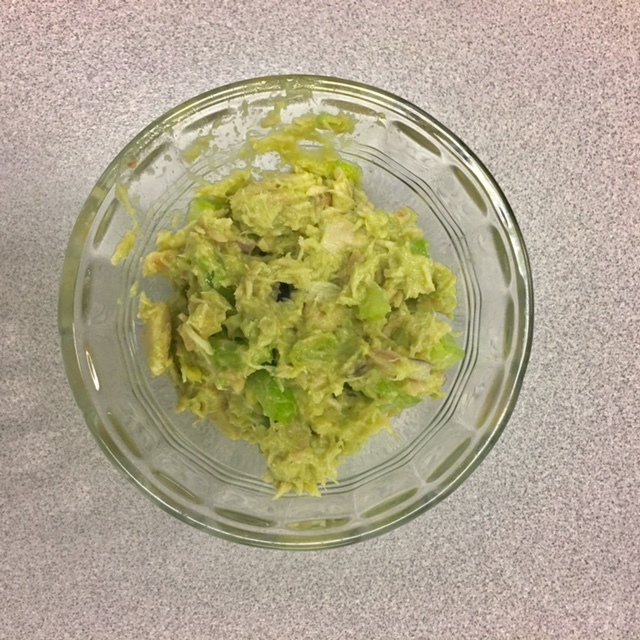 Using a fork, mash the avocado and break up the chunks of tuna as you mix the ingredients. Add more olive oil, salt or pepper if needed. Serve on your favorite cracker, toast or over salad. Makes 4 servings. Nutrition facts per serving: 177 calories, 12 grams fat, 11.5 grams protein, 7 grams carbohydrate, 4 gram fiber, 18 mg cholesterol, 475 mg sodium. Prepare farro according to directions. Set aside to cool. Whisk together vinegar, olive oil, oregano and garlic and set aside. Wash spinach leaves and use a salad spinner to dry. Tear the spinach leaves and place in a large bowl. Add chopped tomatoes, red onions and cucumbers. 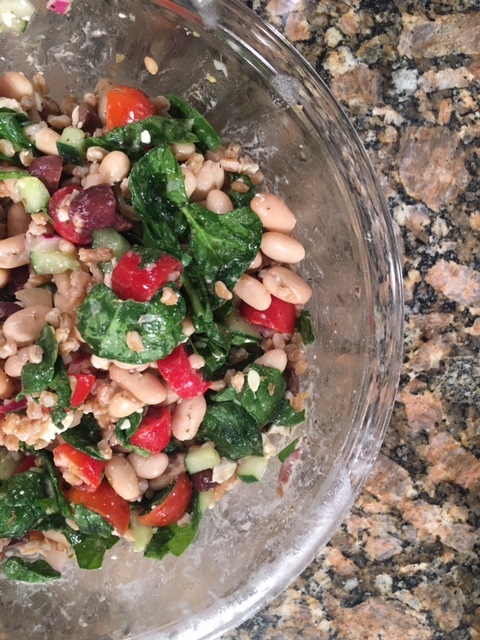 Add farro and white beans to the vegetable mixture, then add the dressing and blend well. Add feta cheese and olives and toss into the salad and serve. 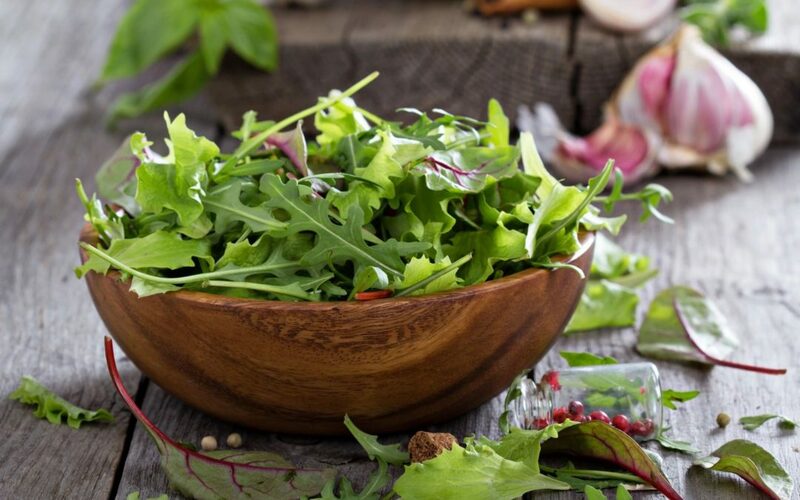 Now that spring is here, it’s time to get your salad spinner out and get your greens on! Raspberries pair nicely with local greens and arugula and fresh lime vinaigrette. Add feta cheese or blue cheese or any variation of nuts or seed you have on hand. You can add quinoa, barley or other whole grain, and grilled chicken or fish to make the salad a meal. Wash and spin the greens in a salad spinner and place in a large salad bowl. Clean and dry the raspberries and add to the greens. Makes 4 (2 cup) servings. Nutrition facts per serving: 164 calories, 12.5 grams fat (1.8 grams saturated fat), 5 mg cholesterol, 11.3 grams carbohydrate, 2.4 grams fiber, 3.7 grams protein, 103 mg sodium. 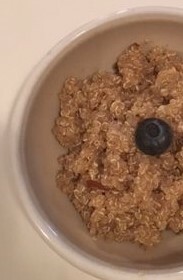 This simple recipe is not only quick, but very healthy. Beans provide a hefty dose of belly-filling fiber as well as protein, potassium, folate and magnesium. In addition, adding tomatoes or bell peppers (high in vitamin C) increases the bioavailability (absorption) of iron in the body, which is important for women, vegetarians and vegans. Black beans are used in the recipe, but kidney beans or pinto beans would make an easy substitute. Drain and rinse the beans prior to using to reduce sodium content by 30%. Leftover chili can be used over rice or in a tortilla for burritos. Place tomatoes in a medium sauce pan and add garlic, onion and spices. Simmer until vegetables are soft. Add 2 cans of beans and cook for another 10-15 minutes until beans are soft. Add salt to taste. Serve with 2% milk shredded cheese. Makes 6 servings. Per serving: 160 calories, 30 grams carbohydrate, 8 grams protein, .5 grams fat, 0 mg cholesterol, 11 grams fiber, 73 mg calcium, 3 mg iron, 500 mg sodium.